Harrison didn't even know that he was standing. His throat was closing and the colour had drained from his face, leaving him slouching in the corner in a cold, nervous sweat. Panic pounded against the walls of his brain, droning out the sirens and Anderson's insistent yelling. Vision filtered through a monochromatic haze, he couldn't see his hand in front of his face. It occurred to him that this might be a dream, which prompted this question: if this was a dream, why couldn't he wake up? Anderson didn't know quite what to do, so he grabbed Harrison by the collar and shoved him hard into the wall. "Listen to me! That timer's about to hit zero and -- "
"You crazy man," stammered Harrison. "You're out of your mind. You're going to kill me. I'm going to die. We're going to die, you're going to kill us, oh my God, I can't believe you're so crazy oh my God what are you doing holy mother of God what oh no..."
Harrison needed to calm down and Anderson was out of ideas. He pulled Harrison back from the wall and shoved him again. Harrison didn't even appear to register the impact. "You're going to kill me." Anderson wondered if Harrison was even hearing him. "You need to turn your key -- "
"You're going to hit self-destruct. I'm going to die." Anderson finally had enough. He slammed Harrison against the wall for a third time. Anderson was not a creative man. "You don't get it," Anderson shouted. "we're not going to press self-destruct, we never were. Listen to me! You have to listen to me! We're running out of time. Do you hear me? That wasn't the plan. 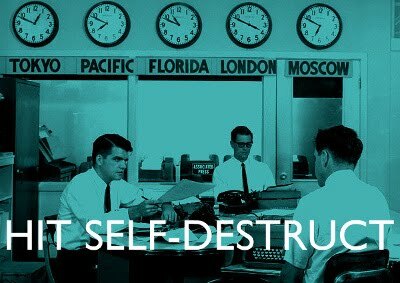 We were never going to initiate self-destruct. We are not about to hit self-destruct. We're about to -- "